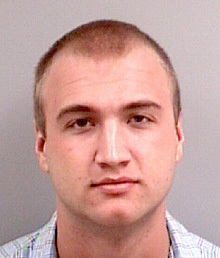 Nick Hogan is facing criminal charges stemming from an August car crash that left his passenger with brain damage. Hogan, 17, real name Nick Bollea, turned himself in to police today on a charge of reckless driving involving serious bodily injury, a felony. He is currently being booked at the Pinellas County Jail in Florida. A second driver, Daniel Jacobs, is being issued a summons to appear in court for a reckless driving charge. Investigators have concluded that Hogan was driving his vehicle recklessly at the time of the Aug. 26 crash, which critically injured his 22-year-old passenger John Graziano. Police have also interviewed several witnesses who say that Hogan was racing Jacobs before he lost control and wrapped his Toyota Supra around a tree. Hogan was driving at speeds up to 60 mph on slick roads with posted signs of only 40 mph. He is also being charged with use of a motor vehicle in commission of a felony, operating a vehicle with a breath-alcohol level of .02 or higher and illegal window tint. Hogan escaped with minor injuries. Graziano, a former Marine, will likely need medical care for the rest of his life.